Our Front Porch is committed to changing the culture of long term disaster recovery by addressing the three core components: housing, trauma, and financial ruin. We utilize a holistic approach to address the cascading effects one experiences following a disaster. Educating communities on the realities of disaster recovery allows us to raise awareness and mobilize others to create real change. Our Front Porch will be the leader in long term disaster recovery in every community. 50 States. 50 Front Porches. The founders, an Architect and a Social Worker, found common ground working in long term disaster recovery. When they focused on their own community, they quickly realized the primary disaster is house fires. They have studied the impacts of home fires on these families and have created a solution to address the 3 interconnected elements simultaneously. Maggie completed an undergraduate degree in Social Work and went on to get a Masters in Social Work from Columbia University in 2003. Upon graduation, she worked with the homeless population in Connecticut for 10 years. During that tenure, she focused on her clinical skills and community outreach, provided trauma-informed treatment to homeless individuals and families, worked with affordable housing, and oversaw the clinical components of the programs she designed. She also supervised a staff of social workers and life skill coaches, as well as Bachelor and Master level student interns. 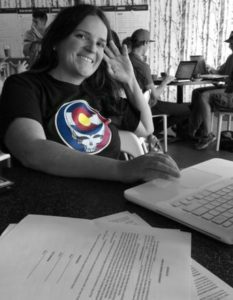 After moving to Colorado, Maggie continued her work with the homeless. She has managed clinical programs and overseen clinical staff to ensure they are using the appropriate clinical techniques to work with clients. She has managed program budgets and worked in conjunction with property management teams to ensure affordable housing units in the Denver Metro Community are efficiently run. Maggie has also been involved with safety committees to ensure client’s needs are met during a crisis. Maggie’s passion for disaster work started in 2005, when the immense devastation from Hurricane Katrina moved her to become a Red Cross mental health volunteer at a Katrina Victims Call Center. After Hurricane Sandy, Maggie organized a donation drive and delivered food, water, cleaning supplies, clothes and medical items to those affected by the storm. Her international disaster work continued as she volunteered with Habitat for Humanity and Builders Beyond Borders international builds. In 2011, Maggie and Heather crossed paths at Habitat for Humanity’s Disaster Corps training, where they both became members and still continue to engage with this program. Our Front Porch is the result of combining Heather’s technical skills and Maggie’s strong clinical training, making it the only place that not only houses the disaster survivors, but creates individual recovery plans that are obtainable and lead to positive outcomes. After receiving an undergraduate degree in Biosystems Engineering, Heather spent time in Africa with the Peace Corps. Upon returning to the United States, she worked as an Environmental Consultant and then went on to get a Masters in Architecture and Urban Design from the University of Colorado. Heather has worked as an Architect for over 10 years in both the private and public sector, with a focus on design, construction, project management and disaster mitigation. Her projects have ranged from small residential remodels to large scale neighborhood master planning. Heather has always had an interest in the impact that disasters have on the built environm ent, and started getting more involved in disaster work in 2012. 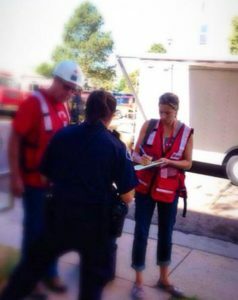 She is a member of Habitat for Humanity’s Disaster Corps and also volunteers with Red Cross in multiple capacities. As well, she was employed by FEMA as a Reservist in their Hazard Mitigation Cadre. With FEMA, Heather worked with local municipalities to help them identify what failed in their buildings and infrastructure, and determine how to build back better. The impact that disasters have on homes and buildings is significant, but it can also be mitigated. The impact that disasters have on people’s lives – financially, emotionally, and socially – is far greater and often impossible for which to prepare. From single-family house fires that affect a few people, to wildfires and flooding that affect thousands, the long term effects on people’s lives is too immense to ignore. The partnership with Maggie has allowed Our Front Porch to be an expert, not only in the physical design and construction of temporary housing, but also an expert in the social and emotional side. Each component has a direct impact on the other. Incorporating both of these into long-term disaster recovery is the only sustainable solution.